Ian stretches the wheelbase of "Crawler Hauler" with a custom 4 link rear suspension and air bags to lower the bed for loading. 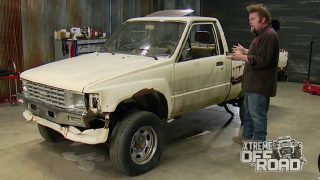 Big block "Rock Bouncer" gets high dollar internal bypass shock system while "Hocus Focus" gets a low-buck suspension. The Raging Bull Rock Bouncer goes off the frame-building jig and onto a set of 43" tires as we finish up fabrication on our 700+ HP beast! More lift and more rubber: Ian transforms a new Ram 2500 Cummins diesel with a BDS lift and a dual-rear wheel conversion. Shark Pool, bending notching station. Air over Hydraulic bender with ability to perfrom 180 degree bends on all types of tubing square and round. WITH BRUTE STRENGTH. 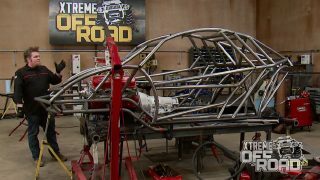 TODAY ON XTREME OFF ROAD WE DESIGN AND WELD TOGETHER A STRONG STYLISH CHASSIS BUILT TO HOLD A BIG BLOCK CHEVY. 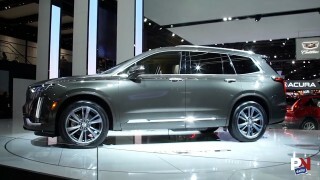 WITH DIFFERENT TYPES OF VEHICLES, AND THAT'S WHAT WE'RE GONNA LOOK AT. WE'LL GO OUT, MEET SOME OF THESE GUYS, TALK TO THE GUYS THAT DRIVE THE CARS AND RACE THEM. WE'LL TALK TO THE GUYS THAT BUILD THEM. 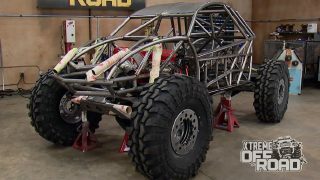 WE'LL FIND OUT WHAT IT TAKES TO KEEP ONE OF THESE XTREME OFF ROAD VEHICLES TOGETHER AND TACKLE SOME OF THESE ICONIC CHALLENGES. THEN WE'LL TAKE ALL THAT INFORMATION, BRING IT BACK HERE TO THE XOR SHOP AND BUILD OUR OWN VERSION OF THEIR XTREME OFF ROAD VEHICLE. OF THOSE CHALLENGES. LIKE HILL CLIMBING IN THE SOUTHEAST WHERE LOCALS BUILD INSANE PURPOSE BUILT RIGS WITH MONSTER AMOUNTS OF HORSEPOWER, AND THRIVE ON A SINGLE MISSION, KILL THE HILL IN AS LITTLE TIME AS POSSIBLE. WEST COAST ULTRA FOUR RACING WHERE ON A SINGLE DAY OVER 100 VEHICLES LINE UP FOR A CHALLENGE LIKE NO OTHER. BILLED AS THE HARDEST SINGLE DAY RACE IN THE WORLD, IT'S THE KING OF THE HAMMERS. THE SUPPORT VEHICLES THAT MAKE THIS TYPE OF OFF ROAD RACING POSSIBLE, MOVING PITS, TOOLS, AND EQUIPMENT TO SOME OF THE MOST REMOTE AREAS ON THE PLANET. RALLY CARS AND RALLY RACING, NOT THE TYPE OF VEHICLE THAT COMES TO MIND WHEN YOU THINK OF XTREME OFF ROADING. BUT SPEND A LITTLE TIME IN ONE AND YOU WILL CHANGE YOUR OPINION. I KNOW WE HAVE. AND LETS NOT FORGET POWER SPORTS, MOTORCYCLES AND SIDE BY SIDES, POSSIBLY THE FASTEST GROWING MARKET IN COMPETITIVE OFF ROADING. NOW WE'RE NOT GONNA PULL ANY PUNCHES COMING RIGHT OUT OF THE GATE. FRAME TABLE WE WANT TO GO OUT AND TALK TO THE GUYS THAT DRIVE THEM AND FIND OUT WHAT DOES IT TAKE TO BE A SUCCESSFUL ROCK BOUNCER. (LUKE)>> I GUESS IT TAKES TIME AND DEDICATION, AND A GOOD CREW BEHIND YOU. YOU'VE GOT TO KNOW HOW TO REACT IN A SPLIT SECOND WHEN THINGS GO WRONG CAUSE THEY GO WRONG EVERY RUN. ANYBODY EVER SAYS THEY HAD A CLEAN PERFECT RUN AND IT WHEN EXACTLY THE WAY THEY THOUGHT, THEY'RE PULLING WOOL OVER YOUR EYES. IT TAKES A LOT OF DETERMINATION AND A WHOLE PILE OF WORK. SOMETIMES YOU'VE JUST GOT TO HOLD IT ON THE FLOOR, HANG ON, AND SEE WHAT HAPPENS. 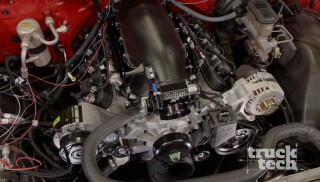 (IAN)>> AND WHEN YOU MASH THE GAS YOU'LL NEED TONS OF HORSEPOWER AND TORQUE AT THE SKINNY PEDAL. 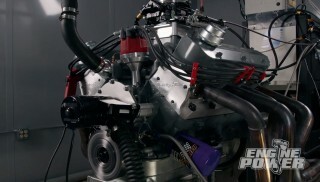 THESE RIGS ROUTINELY PUMP OUT OVER 700 HORSEPOWER. BUT ITS NOT ALL ABOUT HORSEPOWER. YOU NEED A RELIABLE, TOUGH DRIVETRAIN AS WELL. WON'T DO NOTHING BUT SPIN YOUR WHEELS. TIME IN THE TUNING SESSIONS. (BRANDON)>> MAN I WAS BLASTING STUFF THAT BEFORE I WOULD HAVE BEEN UPSIDE DOWN ON. IT IS HUGE. YOU CAN ACTUALLY STEER THE RIG ON HILLS. (IAN)>> AND THE MOST IMPORTANT THING, SAFETY. IF YOUR ROCK BOUNCER'S GONNA DO STUFF LIKE THIS, YOU'VE GOT TO HAVE A STRONG, WELL DESIGNED CHASSIS. SO THE KEY AREAS THAT WE NEED TO FOCUS ON ARE OUR ENGINE. WE NEED LOTS OF HORSEPOWER. OUR DRIVETRAIN, STRONG TRANSMISSION AND STRONG AXLES. A WELL PERFORMING SUSPENSION TO BE ABLE TO GET UP THE HILL, AND THEN SAFETY, A GOOD STRONG CHASSIS. NOW THE WILD CARD IN ALL OF THIS IS THE ONE THING THAT WE NOTICED ABOUT THESE BUGGIES AND THAT IS STYLE. NONE OF THEM LOOK THE SAME. IT DOESN'T LOOK LIKE A WEST COAST DESERT RACE WITH A BUNCH OF TROPHY TRUCKS DRIVING THROUGH THE DESERT. THEY ALL HAVE A LITTLE BIT OF FLARE. SOME LOOK LIKE TRACTORS, SOME LOOK LIKE SPORTS CARS. NOW WE DECIDED TO BUILD OURS OFF A VEHICLE THAT YOU DEFINITELY WOULD NEVER SEE BOUNCING IN ROCKS, AND THAT IS A LAMBORGHINI AVENTADOR. IT HAS NOTHING TO DO WITH OFF ROADING, BUT AT THE END OF THE DAY IT'S PROBABLY ONE OF THE COOLEST LOOKING CARS THAT YOU'LL SEE ON THE STREET. ALL I DID WAS PRINT OFF A PICTURE AND CAME UP WITH A SUBTLE LINE DRAWING THAT'LL GIVE US AN IDEA OF WHAT OUR CHASSIS IS GOING TO LOOK LIKE. NOW IT'S TIME TO BEND SOME TUBE. (ANNOUNCER)>> COMING UP OUR CHASSIS BEGINS WITH A DOUBLE TUBE FRAME RAIL AND HEAVY DUTY ENGINE MOUNTS. (IAN)>> WE'RE BACK ON XTREME OFF ROAD CUTTING AND BENDING SOME TUBE FOR OUR FIRST ROCK BOUNCER PROJECT. NOW SOUTHERN STYLE ROCK BOUNCING RIGS ALWAYS HAVE A VERY SIMILAR DOUBLE TUBE STYLE MAIN FRAME RAIL. OURS IS BUILT USING SOME 120 WALL DOM TUBING WITH TWO 45 DEGREE BENDS 12 INCHES APART. A CROSS MEMBER IS CUT AND NOTCHED, AND THEN BOLTED DOWN TO OUR FRAME TABLE TO SECURE IT. THEN EITHER FRAME RAIL IS BUTTED IN PLACE AND THE SPREADERS ARE WELDED IN. SPACERS ARE CUT AND NOTCHED, AND PLACED ON TOP OF THE LOWER FRAME RAIL PIECE. THEN THE TOP RAILS CAN BE BENT, DROPPED ON, AND THE WHOLE ASSEMBLY IS TACKED TOGETHER. NOW BEFORE WE GO ANY FURTHER ON OUR CHASSIS, WE WANTED TO GET AN ENGINE AND TRANSMISSION IN PLACE SO WE CAN BUILD AROUND THEM. NOW THERE'S LOT OF DIFFERENT OPTIONS WHEN IT COMES TO ENGINES FOR A ROCK BOUNCER, BUT WE DECIDED TO GO WITH THE TRIED AND TRUE BIG BLOCK CHEVY. MONSTER CUBIC INCHES AND A WHOLE LOT OF HORSEPOWER, AND GOBS OF TORQUE. IT'LL BE PERFECT FOR OUR RIG. NOW THIS IS NOT THE ENGINE THAT WE'RE GONNA RUN. THIS IS JUST SIMPLY A MOCK UP BLOCK THAT WE WERE ABLE TO BORROW. 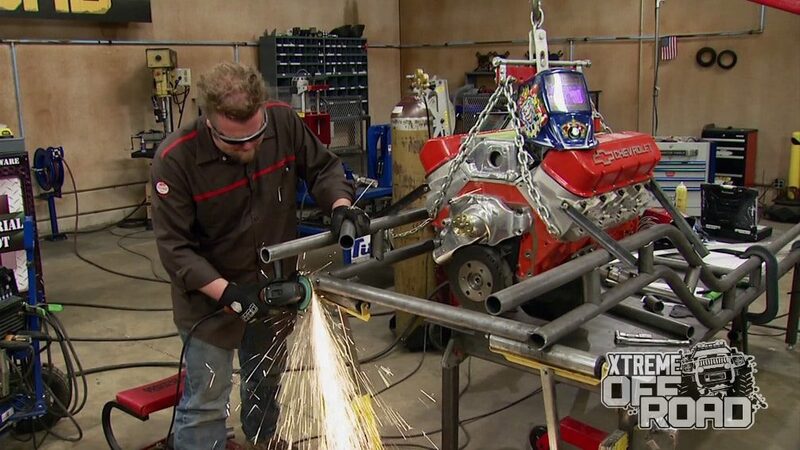 BUT WE'LL BE ABLE TO PUT IT INTO THE FRAME RAIL, BUILD SOME MOUNTS, AND START PULLING SOME TUBE AROUND THIS MOTOR. WITH THE ENGINE IN PLACE BETWEEN THE FRAME RAILS, I'LL FAB UP SOME ANGLE IRON BRACES AND TACK THEM IN PLACE. COME ON, THIS IS BASICALLY AN OFF ROAD DRAG RACER. VIBRATIONS ARE THE LAST OF YOUR WORRIES. NOW TO BUILD OUR MOUNTS WE'RE GONNA START WITH A SET OF ID TUBE CLAMPS. NOW THESE WILL MOUNT BETWEEN THE MOTOR AND THE CHASSIS, AND ALLOW US TO BREAK IT FREE FROM BOTH ITEMS INDIVIDUALLY, AND THAT WILL HELP WITH REMOVING THE ENGINE FROM THE BUGGY. CAUSE BELIEVE IT OR NOT, WHEN THIS BUGGY'S COMPLETELY BUILT, THE ENGINE WILL DROP OUT OF THE BOTTOM CAUSE THERE'S TUBING OVER THE TOP TO PROTECT IT IN CASE OF A ROLL OVER. 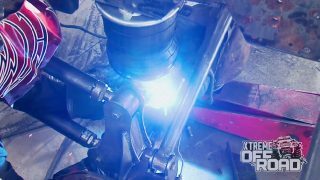 USING AN EXISTING MOTOR MOUNT BRACKET AS A TEMPLATE, PLATES ARE CUT WITH THE PLASMA CUTTER, HOLES ARE DRILLED, AND THEN THEY'RE MOUNTED TO THE ENGINE. THEN THE TUBE AND TUBING ADAPTER CAN BE ASSEMBLED, PUT IN PLACE, AND TACKED TOGETHER. (ANNOUNCER)>> UP NEXT, THE PIECES OF THE PUZZLE COME TOGETHER AS OUR CHASSIS LOOKS MORE AND MORE LIKE A ITALIAN SPORTS CAR. LAMBORGHINI AVENTADOR, AND THERE'S NO WAY THAT WE'RE GONNA MATCH THE FRONT OF THIS CAR PERFECTLY. BUT THEY DO HAVE THIS UNIQUE FRONT SPOILER SETUP. 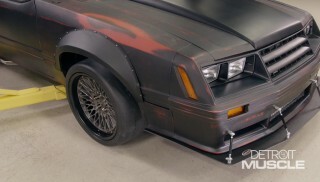 AND IF WE CAN DUPLICATE THAT AT THE END OF OUR FRAME TUBES AS WELL AS ON OUR HOOD ARC, IT'LL JUST REALLY TIE IT ALL TOGETHER. NOW I DID GO AHEAD AND BEND A PIECE OF TUBING UP AT THE ANGLE THAT THAT CHIN WOULD BE BUT THE PROBLEM IS IT'S JUST TOO SOFT OF A ROLL. THE LAMBORGHINI HAS REALLY SHARP ANGLES ALL OVER IT. SO INSTEAD OF ROLLING THIS PIECE OF TUBE, I'M GONNA GO AHEAD AND CUT AND MITRE IT TO BRING IT TO SHARP POINT. TWO CUTS AT 22 AND A HALF DEGREES GIVE US A TOTAL ANGLE OF 45 DEGREES FOR OUR CHIN SPOILER. AND THE FRAME IS TRIMMED TO LENGTH AND A NOTCH IS GROUND INTO THEM WITH A GRINDER AND A FLAT WHEEL. SPACERS ARE INSERTED TO SEPARATE THE UPPER AND LOWER PART OF THE SPOILER. ONCE IT'S COMPLETE WE DEFINITELY HAVE THAT LAMBO LOOK. 188 WALL TUBING, TO MAKE IT A LITTLE BIT STRONGER. BUT WE'RE ALSO GONNA PICK UP A LITTLE BIT OF OUR THEME HERE. NORMALLY WE JUST GO AHEAD AND MOUNT THIS RUB RAIL PARALLEL WITH THE FRAME RAIL. BUT IF YOU LOOK AT A LAMBORGHINI, THERE'S ALWAYS A LITTLE BIT OF A WEDGE SHAPE TO IT FRONT TO BACK. SO WE'RE GONNA PITCH THAT TUBE OUT AT THE REAR JUST TO GIVE US A LITTLE BIT MORE OF AN ANGLED LOOK. NOT DRASTIC, JUST SUBTLE, SUBTLE ENOUGH TO MAKE PEOPLE THINK MAN, THAT BUGGY DOES LOOK LIKE A LAMBORGHINI. A SIX INCH SPACER AT THE FRONT AND AN EIGHT INCH AT THE REAR GIVES US THE PERFECT AMOUNT OF ANGLE FOR OUR CHASSIS. THEN TUBING IS SIMPLY CUT, ROLLED, AND TACKED TO THE CHASSIS BUILDING UP TO THE ROOF LINE TO COME UP WITH OUR PROFILE. TALLER, AND PULLED IT IN A LITTLE BIT TIGHTER BECAUSE WE'RE BUILDING A ROCK CRAWLER. NOW ALL I HAVE TO DO IS DUPLICATE THIS PROFILE ON THE OTHER SIDE OF THE CAR AND THEN CONNECT IT WITH SOME MORE TUBING. 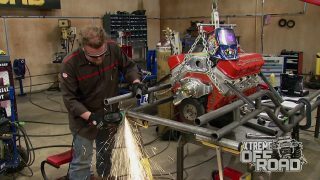 (IAN)>> WE'RE ABOUT THREE QUARTERS OF THE WAY THROUGH THE DESIGN PROCESS OF BUILDING OUR LAMBORGHINI INSPIRED ROCK BOUNCER. NOW THE BACK OF THE RIG IS WHERE THINGS GET A LITTLE BIT TRICKY. SEE LAMBORGHINIS ALWAYS GET FATTER AT THE BACK. YOU DON'T WANT THAT ON A ROCK BOUNCER. YOU WANT TO BRING IN ALL THE TUBING REALLY CLOSE TOGETHER. THE ONLY THING THAT'S NORMALLY BACK HERE IS JUST A FUEL CELL AND THEN A LITTLE BIT OF CHASSIS WITH ROOM FOR THE TIRES TO ARTICULATE. NOW WHEN LOOKING FOR THAT SIGNATURE PIECE ON THE AVENTADOR TO HANG ON THE BACK I COULDN'T FIND ANYTHING UNTIL I SAW THIS PICTURE AND NOTICED THIS VERY UNIQUE EXHAUST OUTLET. IT'S GOT NICE SHARP ANGLES, GOOD RECTANGLE, IT'D BE A GOOD THING TO SORT OF ANCHOR THE THEME ON THE BACK OF THIS RIG JUST LIKE WE DID WITH THE CHIN SPOILER UP FRONT. WE'LL BUILD THAT RECTANGLE PROBABLY ABOUT THIS BIG, HANG IT OFF THE BACK, AND THEN JUST BRING ALL THE TUBES INTO IT, SLUG ALL THE JOINTS FOR STRENGTH. AND THEN ONCE THAT'S DONE, WELL THE DESIGN PROCESS OF CHASSIS WILL BE FINISHED. THE MOCK EXHAUST PIECE IS CUT AND TACKED TOGETHER. THEN TRIMMED TO THE CORRECT ANGLE USING OUR BAND SAW. A PIECE OF TUBING IS ATTACHED TO THE CENTER LINE OF OUR FRAME TABLE TO HOLD IT IN THE AIR THAT WILL BE THE BACK OF OUR BUGGY. ONE AND A HALF INCH DOM TUBE SLUGS ARE INSERTED INTO ALL OF OUR TUBE JOINTS. THEN TUBING MOVES FROM THE BACK OF THE PASSENGER COMPARTMENT TO THE REAR EXHAUST PIECE, FINISHING OUT THE BACK OF OUR CAR. WE GOT REALLY LUCKY WITH THESE UPPER TUBES ON THE BACK OF THE CHASSIS. ORIGINALLY MY THOUGHT WAS TO JUST CONTINUE THAT ROLL ALL THE WAY DOWN TO THIS REAR SECTION. BUT ONCE IN PLACE IT JUST DIDN'T LOOK RIGHT. THESE STRAIGHT PIECES WITH THE BEND AT THE TOP LOOK A LOT BETTER, AND MORE IMPORTANTLY, THE BACK OF THE BUGGY NOW ALMOST LOOKS EXACTLY LIKE THE ENGINE COVER THAT'S ON THE BACK OF THE LAMBORGHINI AVENTADOR. SOMETIMES IT HAPPENS WHEN YOU'RE BUILDING A CUSTOM BUGGY. IF SOMETHING DOESN'T LOOK RIGHT YOU'VE GOT TO STOP, TAKE A STEP BACK, AND HAVE A LOOK AT IT. AND SOMETIMES THE SOLUTION ENDS UP BEING BETTER THAN THE ORIGINAL PLAN. NOW I'M REALLY HAPPY WITH HOW THE CHASSIS TURNED OUT. SOMETIMES IT'S HARD TO WORK WITH THIS ROLLED TUBING WHEN YOU'RE MIXING IT WITH A LOT OF STRAIGHT PIECES. BUT I THINK WE KIND OF NAILED OUR ITALIAN SPORTS CAR LOOK HERE. THIS BUGGY IS FAR FROM FINISHED. RIGHT NOW WE BASICALLY JUST HAVE A SKIN THAT LOOKS LIKE SOMETHING. THE NEXT STEP IS TO GO IN AND ACTUALLY MAKE IT STRONG. WE HAVE TO ADD IN ALL THE BRACING IN VERY KEY AREAS TO MAKE IT BE ABLE TO HANDLE THE ABUSE THAT A ROCK BOUNCER'S GONNA SEE ON THE TRAIL. BUT FOR NOW, YOU KNOW I HAVE TO SAY, THAT IS A GOOD DAY'S WORK!